« Fasching or Carneval …it is all the same! One Sunday after church friends gathered in our small living room on Parkman Ave in Los Angeles……Stefi Tant brought a cake that looked all chocolate and the aroma waved all the way to my bedroom where I sat at my desk studying for Monday’s exam. The exclamations from our guests were so loud that I finally got up to see what all the excitement was about. Coming closer I saw that a cake was the center of everyone’s shouts of joy and surprise. I quickly walked closer and saw that the cake was cut and the multi-layered slices were the reason for the enthusiastic and complimentary words for Stefi Tant and her creation of a most beautiful pastry. Many years later, after I was married Stefi Tant came to visit us, and in one of our conversations I asked her about that particular cake on that special Sunday when she surprised all of us with the most delicious Torte. 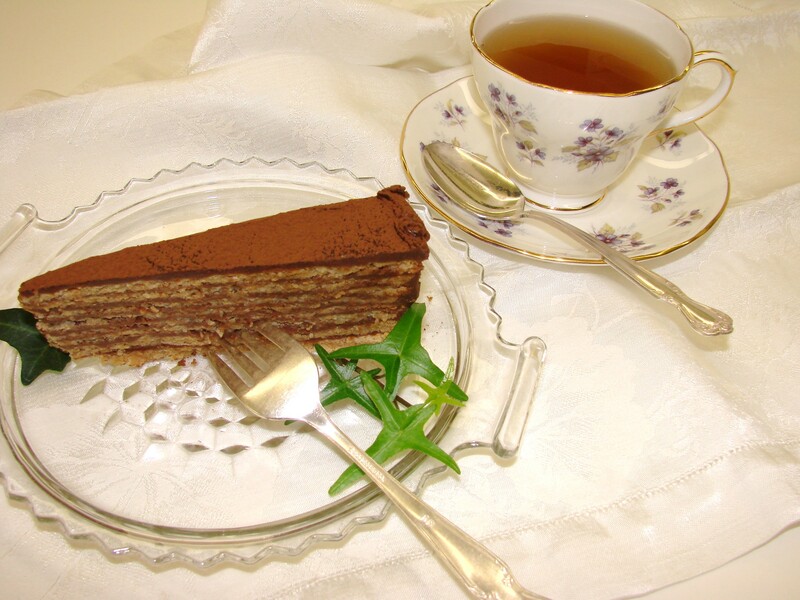 She then told me that it was called Reform Torte…….and that it was named in memory of the Reformation Period which happened in the 15 hundreds in Germany and Austria. She shared the recipe right then and there at the kitchen table where we sat while I wrote down every word and instruction that she gave me. After her visit I made the cake and it was just as delicious as it was when I first tasted it so many years ago. The incredible thing was that her directions and instructions were so exact that I could not have made the cake without them…….it was her baking expertise that she conveyed to me with which I could claim my success in reproducing this fantastic cake. On 2 sheets of parchment paper draw a circle using a 10 inch spring form bottom. Turn the parchment paper over in order not to bake on the drawn side. Beat the egg whites slowly together with the cream of tartar for the first 5 minutes, then increase the speed to a medium speed for the next 5 minutes. Now add the sugar slowly and increase to high speed and continue beating until the whites are quite stiff, but not dry. Remove beaters and add the walnuts, corn starch and bread crumbs (if used), and mix these ingredients with a spatula gently until the batter is well mixed. Now spread a layer of that batter onto the rounds of the parchment paper…….it should be about ¼ to ½ inch thick. Stay within the circle as much as you can. Pull the parchment paper with the walnut batter onto a cookie sheet and bake it at 350 F for 10 minutes…….then decrease the heat to 300 F and bake until lightly browned. While the first layer is being baked spread the batter on the second round on the parchment paper, and proceed with the baking instructions as with the first layer. Continue until all the batter is baked and you have about 6 or seven layers. If you spread the batter thicker you will have fewer layers……which is not a problem. These layers can be made a couple of days ahead and stored in air tight containers. Use a sauce pan and put the instant coffee, the egg yolks, cornstarch and sugar into the cold milk, and mix well. Heat this mixtures to boiling while mixing continuously…..as it begins to simmer and then boil……quickly remove the mixture from the heat and mix vigorously until the cream has become thick and shiny. If you feel more comfortable you can make this pastry cream over a water bath. When the cream has thickened add the chocolate chips and stir until they have melted into the cream. Now add the butter and also stir until well incorporated and completely blended into the cream. Transfer the chocolate cream into a plastic container and seal it with a lid. Place it into the refrigerator overnight to be completely cooled. Stack the walnut layers with adding the chocolate cream between them. The layers of the chocolate cream need to be quite thin, because you need to have enough cream to ice the cake with it as well. To decorate the cake one can take walnut halves and place them around the edges of the cake or simply dust the top of the cake with cocoa powder. The cake needs to be refrigerated until it is served. The meringue layers will soften with the chocolate cream and will have a very smooth and creamy consistency while you and your guests savor every morsel. 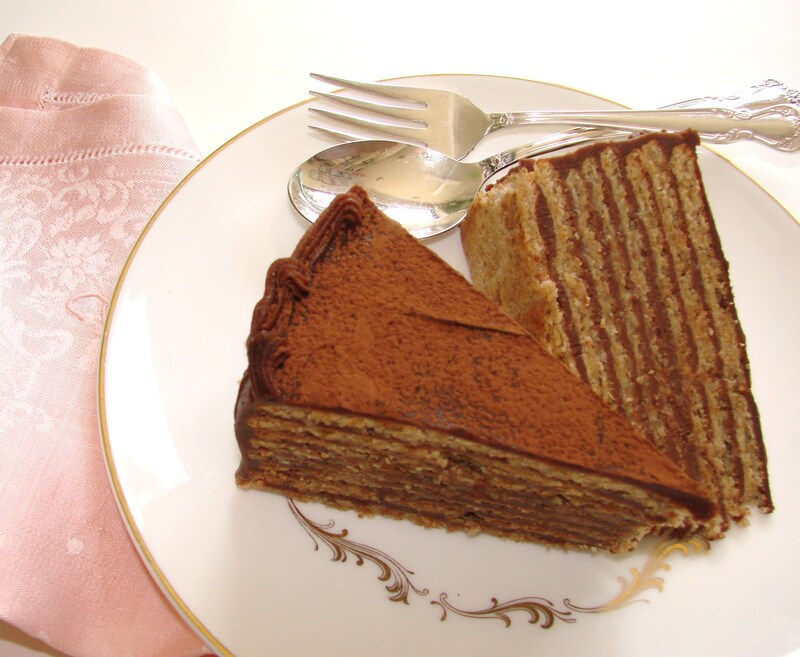 Let me know if you have heard of this cake before….or know it by another name! Thank you so much for giving us this recipe, Maria! I’ve already saved it and have a special occasion for making it soon. In the directions of how to make the cake……….I have originally left out the sugar………. Please, copy the recipe again and safe this copy….. Sorry about omitting a vital step…………. Once we made a hazelnut torte much like this. It was simply amazing-the most beautiful cake ever. I have sent this link to Anne-Marie who is the baker in the family. Hi Mary-Ann…….so nice to hear from you, and I am happy you sent this recipe on to your daughter. When Anne-Marie and I made the Noisette de Couche Torte (?) with Babette a French cooking instructer and friend she had us make think chocolate form decorations for the top. They were circles and ? Can’t recall the shapes. Maybe Anne-Marie will remember. It was heavenly and I think your cake just might surpass it! the decorations sound really special……I would love to hear how they were made……….. I can make flat round chocolate kind of dollar decorations, and when I use them I put a rosette of the chocolate icing under them and tilt them to one side…..that too is quite impressive….I did not think of it when I made this cake………next time I will remember it. Thank you for bringing back a memory…….. This cake looks amazing. My family of chocoholics would love it – will have to see if I have the skills to make it. Hi Judy…………thank you for your nice comment……..I am sure you can make it…..it is not difficult. Call me and I will walk you through it – it is really very simple. What a lovely post. 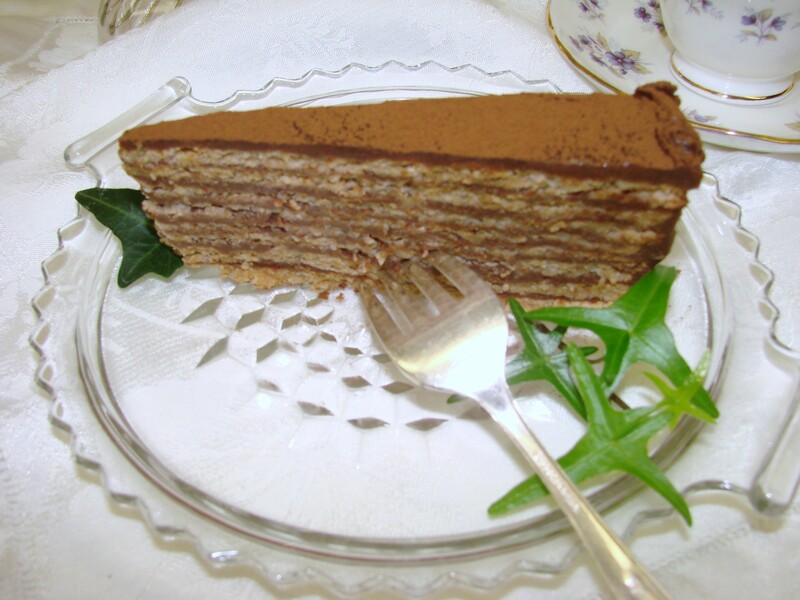 I recall the torte from my years in Germany, but know know if that was what locals called it–I think maybe not. Your photos are nice, too–lots of time spent propping I bet!? Now I have told my husband that I will need a new camera…….when he just raised his eyebrows………lol…..
A big hug to you…….. Sounds delicious! I’ll put this one in my file for future use! Thank you for your comment…….am glad that you will be saving it in your files…….. Thank you Maja for this wonderful recipe. I will give it a try for my granddaughter’s First Holy Communion celebration. Thank you also for all of your wonderful recipes and stories of Austria. I so look forward to them. Please keep them coming. It is my first time reading your blog and I felt like I was in your lovely kitchen during a cooking class learning the story behind the Reform Torte. You have a gift of teaching so beautifully!!! Thank you for your lovely note……..and thank you for liking my blog. Yes…..we did have a great time during those busy seasons of cooking classes. I remember you used to come with Linda your sister-inlaw. Thank you for keeping our friendship for such a long time….you are one of my loveliest and special friends………. Love and hugs to you………..always! Oh. Maria. My mouth is watering. Mmmmmmmmmmmmmmmm I am trying to lose weight so this cake will have to wait until I do. How perfectly tempting! And your photography and presentation is, as always, exquisite. This looks spectacular. We’ll have to give it a try some day. Your recipes are delicious. This is perhaps the most adventurous one I have seen… Gonna try it. Thanks. I know it has been a lot of work on your part… wish I had your dedication. Linda………thank you for your nice words and comment……..I am sure you can make this cake…..it just takes a little time……..but, it is not difficult………..
Hi Maria, thanks for a beautiful recipe and photos. My daughter will celebrate her 22nd birthday next week, and I want to bake the Reform Torte for her. Although constructed differently from the Reform Torte, Le Succes, Le Progres and La Dacquoise are all meringue-nut layer cakes with butter cream frosting and filling. 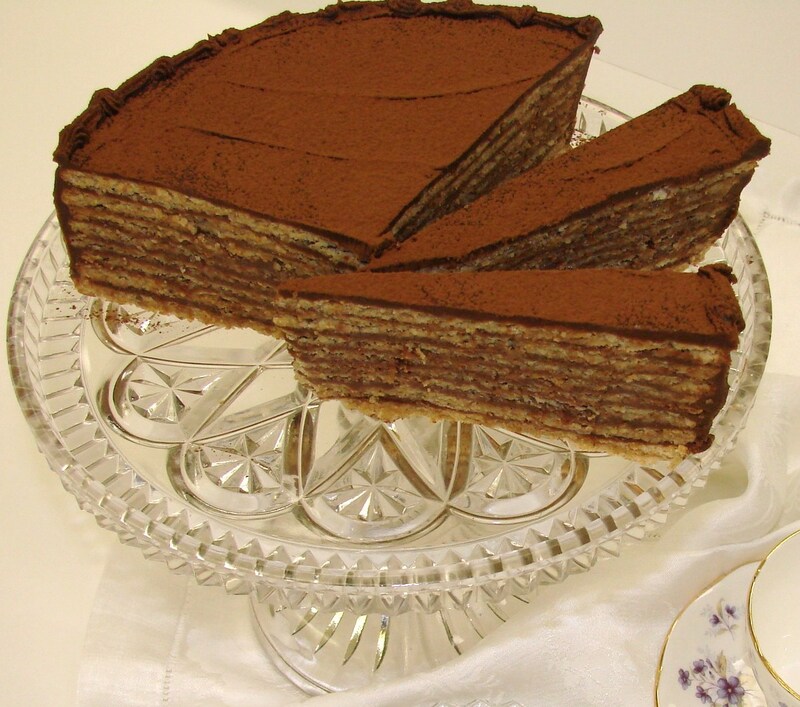 I made one with ground hazelnut pralin in a heart shape for my dad’s birthday years ago–and still remember it. Recipes may be found in volume 2 of Julia Child’s Mastering the Art of French Cooking. Hi Sheila……….so nice to hear from you……..it is great fun to find out that this cake can be even found in Julia’s book…….and yes, this cake can be made with just about any nut…….. I love the texture and the flavor…..it is a very special treat for me………. Mary-Anne………….it is so sad when the older generation does not hand down their recipes and cooking skills that they have acquired through out the years……..
But……..my mother told me about these inherent ways of the Slavic people……….. and yet they have learned it from their mothers and grandmothers………. It is their loss……..they do not know the joys of sharing!!! I made the reform torte for my birthday party yesterday, and everyone (especially my husband) commented on what a wonderful cake it was. Thanks you! Perhaps because we were experiencing humid weather when I baked the cake, I found that the beautiful cake layers were not so clear cut as the photos in your blog post. Nevertheless, it was really yummy. I was surprised to see that the icing was like a concentrated pudding, with milk and cornstarch. It was spreadable even straight from the refrigerator. Very interesting! I also like that most of the sweetness came from the meringue rather than the icing. The flavors were nicely balanced. Thank you Sheila for your nice comment!!!!!!!!! I am happy that the Reform Torte was a success in your family….. I am really happy that you made this cake……my family loves it very much as well! Hope to chat with you sometimes soon……..
Maria, a guest at my birthday party asked for your recipe, and I sent it to her. Now she has made it, too, and her dinner party guests were wild about it. Thanks again.